Butternut squash is part of the winter squash family, which also includes such favorites as the spaghetti squash, acorn squash, delicata squash, and of course pumpkins. It’s usually one of the last plants harvested from my garden, generally at the same time that I’m cutting pumpkins off the vines for the front step. Since it’s one of the last crops in the garden, I find it suiting to always make it one of the last foods on my grill before winter comes. 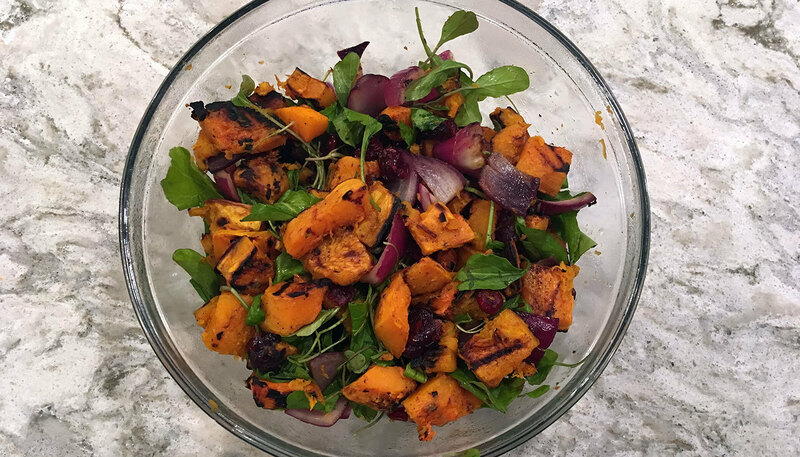 I never quite found an amazing recipe for butternut squash by itself, so I’ve resorted to making a sort-of-salad kind of side dish. It’s not REALLY a salad, but it has some green leaves in it, so it can pass as one. Incorporating the arugula that I’m harvesting at this time of year, plus a nice big red onion from earlier in the season, gives me the satisfaction of eating the food that I’ve grown throughout the year. Yes, there are also cranberries in this recipe. No, I did not grow the cranberries. Though I may try one year. This recipe pairs PERFECTLY with a nice grilled pork chop, or some herb roasted chicken. If you don't have the 3 main ingredients in your garden, hit the local farmers' market. 1 ) Cut the squash into ‘grill-able’ sized slices, between 1/2 and 3/4 inches thick. If you’re comfortable with the terms ‘cauliflower steak,’ and ‘cabbage steak,’ go ahead and call these ‘squash steaks.’ I, however, am not a fan of the trend. I call them what they are. Squash slices. 2 ) Brush some oil onto both sides of each squash slice. Crack some pepper and sea salt onto them, and dash a little bit of paprika on as well. If you want to spice it up a bit, hit it with some chili powder, or cayenne. 3 ) Cut the onion in half. Peel off the outermost layer. Score the cut sides of the onion - this will help after it’s grilled. It’s much easier to cut raw than when it’s cooked. Be sure not to score so deep that you cut through the onion, which will make it difficult to handle on the grill. 4 ) Brush some oil onto the onion halves, crack some pepper and sea salt onto them, and dash a little bit of garlic powder on as well. 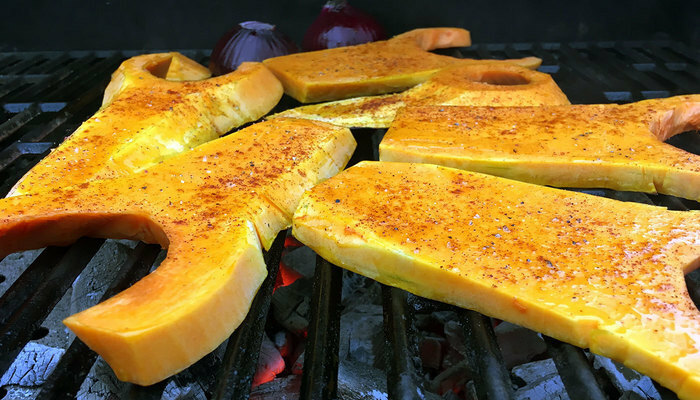 5 ) Grill the squash slices and onion halves on medium heat. If it’s too hot, you’ll burn the squash. If it’s not hot enough, the squash won’t cook through and will be hard. Onion Grilling Tip: The onions will do well if you put them cut-side down first. When you go to flip them, slide one end of your tongs under them, and grip the top and bottom. If you try to squeeze from the sides, the layers will start popping out. 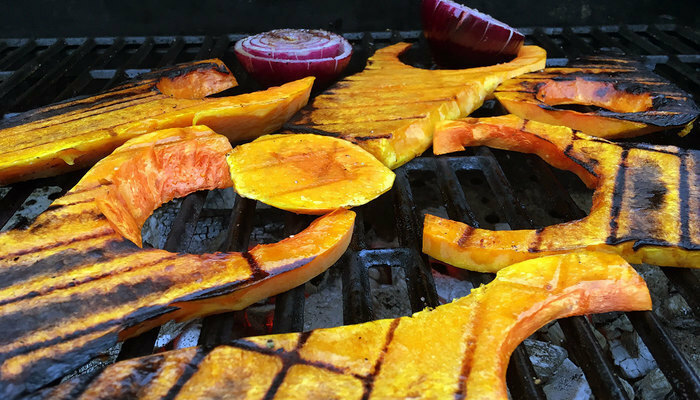 6 ) After a few minutes, flip over the thinnest squash slice to see what kind of grill marks you’re working with. If it looks good, flip them all over. if it’s burned, flip them all over and turn the heat down. If it barely looks like it’s changed color, leave them and crank the heat up a bit. 7 ) When the ‘steaks’ are looking perfect, remove them from the grill and get them back on the cutting board quickly. You want to keep them hot. Cube up the squash and onions. 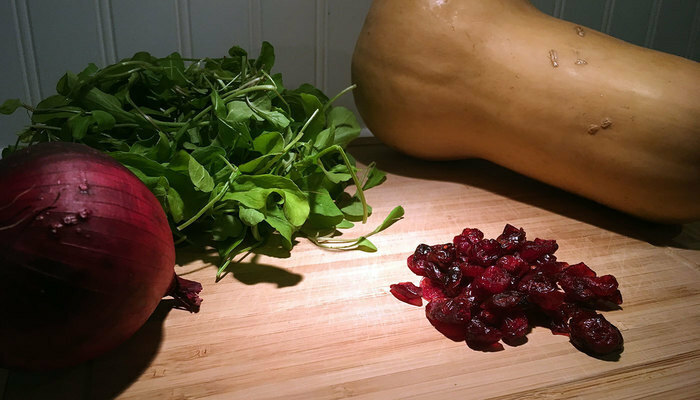 8 ) While still hot, toss in a large bowl with the arugula, cranberries, a bit of oil and some more salt and pepper. If you took too long cubing the squash, wrap some aluminum foil on the bowl to keep things hot for awhile before serving. For best results, serve while warm. It's OK cold, but so much better warm.